If you’re looking for tips on how to soundproof a basement ceiling, then you’ve come to the right place! Typically a ceiling assembly has a subfloor upstairs; And on top of the subfloor, you’ll have your finished flooring. Your finished flooring upstairs is usually a hard surface like hardwood floors or ceramic tiles which is supported by your floor joists. 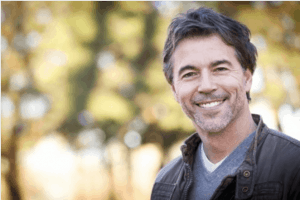 In most cases, you’ll have a hollow cavity. When people are walking upstairs, you can hear the echoes reverberating, that can get very loud for tenants living in the basement. The focus here is to learn how to absorb most of that sound and how to reduce the noise making it’s way to the basement and also the other way around. We will go into detail on two types of basement ceiling soundproofing. What is Resilient Channel and what does it do? The first type of ceiling soundproofing we will talk about is for a finished basement, which would have a closed ceiling. That means the hollow cavity of basement ceiling is already covered in already sheetrock. The second type of ceiling soundproofing we will deal with is an unfinished basement ceiling where you have an open cavity and no sheetrock attached. We will also touch on how to soundproof a staircase leading to the basement. Soundproofing basement ceiling in a new home. So how would you soundproof a finished basement ceiling? You might think its difficult, but there are some easy and inexpensive ways to get the job done. There is a way of going about soundproofing your existing basement ceiling. You can make this a DIY job or hire a professional. Sometimes hiring a professional is best if you’re unsure of how to go about it; But hopefully, by the end of this guide, you’ll have all the knowledge to make it work! Before I began soundproofing my home, I had no idea what resilient channel was. I’m also sure that some of you have never heard of this item either. Resilient channel is a thin metal channel that is intelligently designed to substantially improve the sound insulation of drywall, sheetrock, plasterboard walls, and ceilings. The channel efficiently isolates drywall from the framing stud work, which results in substantially weakening the sound waves substantially. This is done by leaving an air gap between your existing ceiling and your new ceiling. Air is a great sound isolator. Think of it like this; solid is the easiest path for sound to travel. A popular example would be placing your ear on the rail of a railroad track so you can hear the train before you can hear it standing up. A liquid is the second best sound isolator, and the sound traveling by air is the sound that would get to you the slowest. Explanation for a resilient channel. If you’re installing the resilient channel using clips, you will need to screw the clips onto the joist. You can easily find the ceiling joist with a stud finder. Install clips 48″ between clips and 24″ between channels and within 6″ from the side walls. Once the clips are installed, simply snap your resilient channel into the clips. 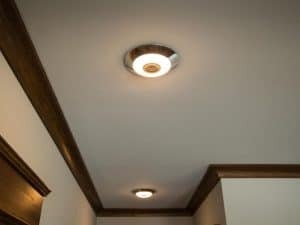 If you have any fixtures or air vents, you will need to lower them to fit the new ceiling height. When you expose the electrical boxes for your light fixtures, make sure to place some putty pads around the electrical box because sound can travel there if there are vibrations of people walking above. Also, if you have air conditioning vents, you should stick some metal dampening strips inside to lower the sound transfer that would be coming from the vent. Now you’re ready to install your layer of sound deadening drywall onto the channel. Make sure to use screws that are maximum 1.5 inches long as we do not want the screws to touch the joist. Make sure to use soundproof cocking to fill any holes or cracks. One thing a lot of people fail to do is to soundproof the basement stairs. The process of soundproofing the stairs leading to the basement is inexpensive and easy to accomplish on your own. If you’re buying sound deadening insulation for your unfinished basement ceiling, buy a few extra layers, enough for the staircase. You should already have a 2X4 attached to the center of the stairway from top bottom. The 2X4 will be what holds your sound deadening insulation in place. Cut smaller pieces of insulation in the size of the inside of the staircase and place them inside each step behind the 2X4, Just like in the picture. If you’re thinking about soundproofing the basement ceiling before it’s complete, then you’re in luck because that will be the most straightforward process. This process will also give you more options on how to go about getting the job done. The first step is to install the proper insulation that has sound deadening capabilities. Head on down to your local hardware stoor and ask them for sound deadening insulation or you can find an Amazon link below. They would know what you’re looking for and point you in the right direction. A recommended brand is Roxul Rockboard Acoustic Mineral Wool Insulation. 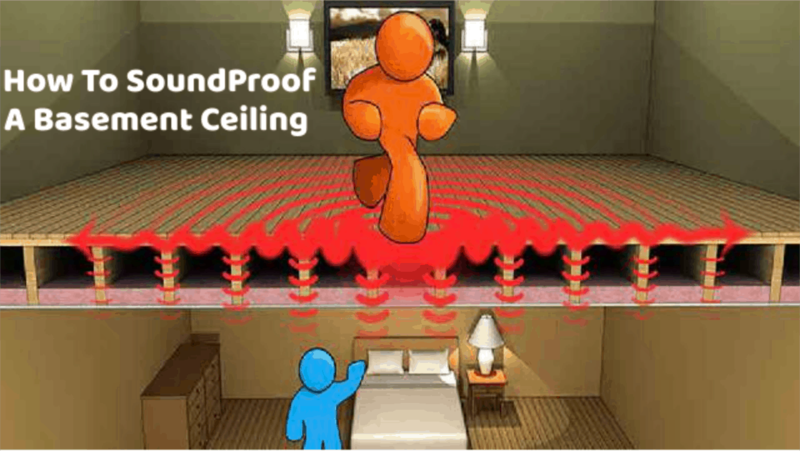 To achieve an excellent soundproof basement ceiling, you will need two layers of soundproofing insulation (Ruxul Rockboard Acoustic Mineral Wool Insulation from Amazon) in your ceiling cavity. 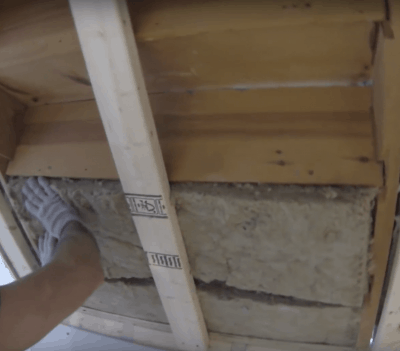 Your first layer of insulation is at the very top of the ceiling cavity that’s flush with the floor. Then you have an air gap that helps in sound isolation. The third layer of soundproof insulation will be at the very bottom, flush with the bottom of the floor joists. For the fourth layer will be the resilient channel. It’s essential that you do not squish the sound deadening insulation while installing it into the cavity; Doing that would compromise the soundproofing capabilities. You want the insulation to be in its out of the box natural fluffy state. It’s your choice if you want to have one layer or two layers of insulation, but I would recommend two layers because it will be more effective at blocking the noise coming from the upstairs. The second layer of insulation will also help in sound deadening. If you’re worried about disturbing the basement tenants when people are walking around on the main level, then the second layer is a plus. It all depends on your budget. Step 1 – Now you’re ready to install the first layer of soundproofing drywall onto your resilient channel. As we mentioned during our finished basement ceiling tutorial, make sure to use screws that are maximum of 1.5 inches long as we do not want the screws to touch the joists. Step 2 – Apply Green Glue Noise Proofing Compound (Click Here for Amazon Link) to the back of your second layer of drywall in any random pattern. Use two tubes of green glue for every 4 X 8 sheets. Leave two to three inches clear at the edges to allow yourself space to handle the drywall. Step 3 – Screw the second layer of drywall to the hat channel as well. Ceal the perimeter of the ceiling with a high-quality acoustic compound such as Green Glue Sealant (Click Here for Amazon Link). Step 4 – One common issue while redoing existing ceilings is the gap left between the vents and the new ceiling; which allow sound to come through. You can quickly solve this by using a pool noodle or some water pipe insulation, depending on how big the gap is of course; Then use some Green Glue Sealant to keep it in place. You could buy some special foam for filling these gaps, but there’s no reason to spend more money when you can buy a pool noodle for a dollar. Your basement ceiling soundproofing is now complete. You can go ahead and spackle, tape and paint as you would a standard ceiling. We recommend using drywall mesh tape anytime you use green glue or clips. Thank you for visiting our website, We hope you found this information helpful. Leave a comment if you think we missed something or if you have some comments or advice.